Recipe for the day: pancakes "Suzette"
Maslenitsa in 2018 will be held from 12 to 18 February. We offer to prepare delicious pancakes with orange sauce. Thin pancakes "Suzette" - one of the most famous desserts of French cuisine. They represent a winning combination of the finest crepes and refreshing citrus sauce. About the invention of this recipe is a lot of legends and romantic stories. 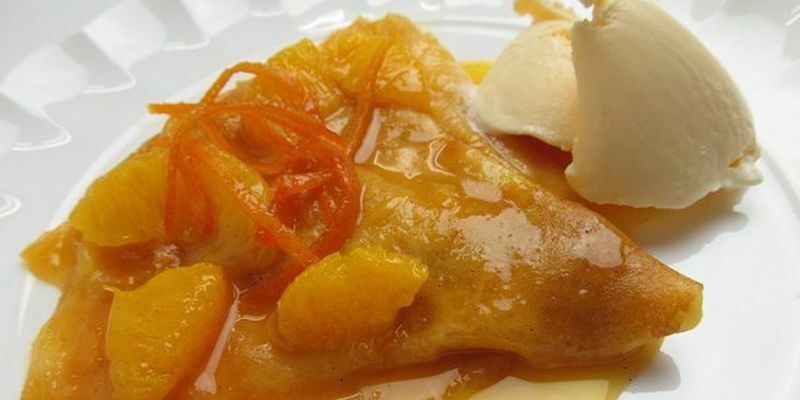 In the restaurant pancakes "Suzette" are often prepared in front of the visitor. 1. Put the flour, sugar and a pinch of salt in a large bowl. Make a hole in the center, add eggs, butter and 2 tbsp. l. milk. Beat whisk until smooth. Slowly pour in the remaining milk, stirring to make a smooth dough without lumps. At the end, add the beer. 2. Heat a small pancake pan and fry delicate pancakes on it. Fold ready crepes on a plate. So that they do not cool down, cover them with foil. 3. For the sauce, heat the butter and sugar in a deep frying pan. The mixture should be bubbly and acquire a golden hue. Pour orange juice and add grated zest. Cook the mixture for another 3-4 minutes until it starts to thicken slightly. Add liqueur and cognac, warm up for a few seconds and reduce the heat. 4. Put one pancake in a pan with sauce. The liquid must completely cover it. Then, using a spatula, fold the pancake in half and again in half. While holding the resulting triangle at the edge, tilt the frying pan so that the syrup stack in the opposite direction. Put the pancake on a warmed plate. Do this procedure with all the pancakes, pour the remaining syrup. 5. Serve pancakes "Suzette" together with a ball of ice cream. 1 Response to "Recipe for the day: pancakes "Suzette""